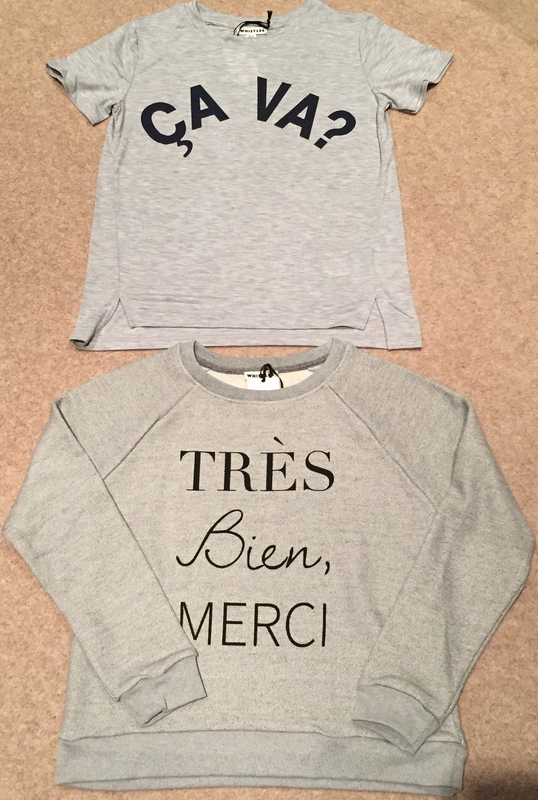 This week I am allowed to brag… I got my hands on THE most wanted Whistles Jumper and T Shirt in town!! Whistles continues to bring out French themed garments with sayings which most of us will understand the translation, particularly if you studied French at school. These quirky, cute and sophisticated garments make any outfit stand out. Sizes are selling out fast, in fact I believe I managed to get my hands on the last size medium jumper online! Go me!! The jumper has a soft luxurious feeling. Cut from a luxe grey marl jersey, in a classic athletic inspired fit and with a trio of different typefaces, ribbed collar and sleeve detailing. This casual sweat is ideal when layered with a crisp white shirt and luxe joggers for laid-back effortless chic. It retails at £75. The T shirt is now sold out unfortunately. It retails at £45 and has a silky soft feeling. It can either be dressed up or down adding a pop of sophistication and glamour. I also had a bit of a shopping spree in Nike. 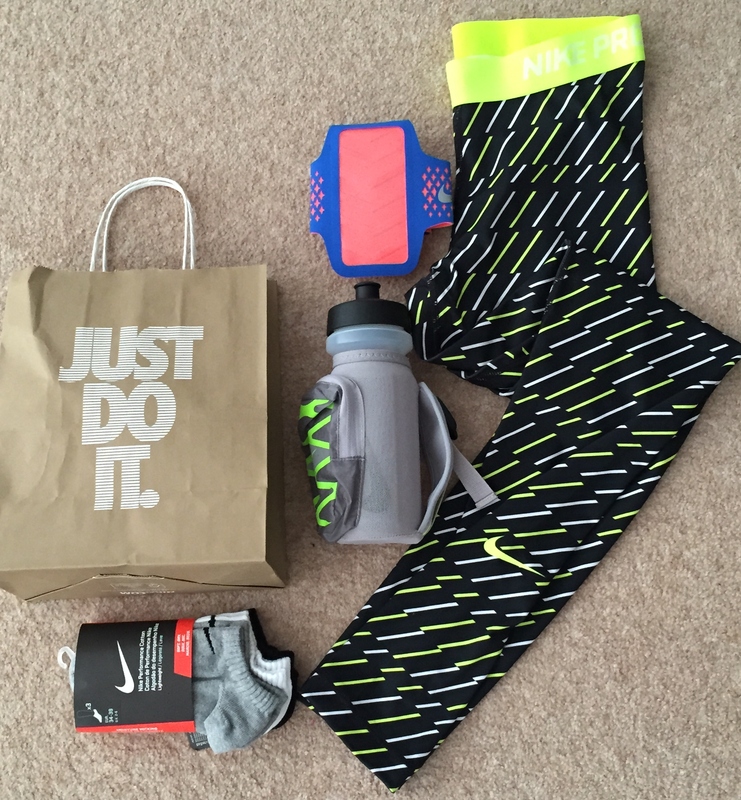 I picked up these Nike Pro Running Tights – £25 which are new to hit the stores. They are very flattering when on and the pop of colour, for me, makes me happy when working out. I picked up this brilliant and yet simple creation – a water bottle in a holder which has a zipped pocket for your keys – £18. I don’t know about you but I seem to carry a lot of keys in London. When I was back home in the countryside we had 1 key… here, well I have 5 different ones for my apartment which makes it rather annoying having that in your pocket whilst running. This solves a lot of problems, for me anyway! I purchased a new Iphone/Ipod holder which attaches to your arm whilst your working out – £25. These are great as it keeps your headphone wire out your way and can work out with no distractions. It velco fastens so it is very easy to use. I love the colours of the one I picked up and it has the diamond design, another new design to hit the stores in the UK. And finally, it wouldn’t be a shopping trip without buying some socks! These trainer socks (£9) are great for keeping your feet fresh. They’re very comfortable and don’t slip down.. which is essential when running.